It doesn’t take much to disrupt the jury-rigged system BP has designed to contain some of the oil spewing into the Gulf. Just a few days ago an underwater remote operated vehicle bumped into a venting system, requiring BP to remove the containment cap for about half a day—during which time oil flowed from the well virtually unchecked. 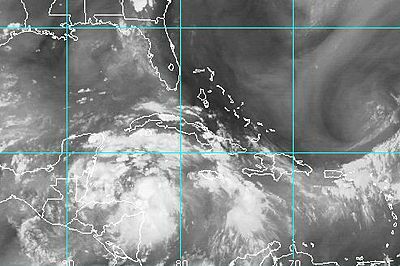 Meteorologists in the AccuWeather.com Hurricane Center are gearing up for what is likely to be the Atlantic basin’s first tropical storm or hurricane over the next several days. Regardless of the track of the feature, there will be some trouble in the oil slick area next week. A zone of disturbed weather in the western Caribbean Sea as of Friday afternoon tracking west-northwestward through the weekend is the focus of most of their attention. Hurricane hunter aircraft are investigating the area of disturbed weather at this time. A northward turn of this feature would be of great concern for oil slick and Katrina anguished areas of the central Gulf Coast. At his press briefing on Friday, Coast Guard Admiral Thad W. Allen that it would take about five days to disconnect the drillship Enterprise—which is processing about 25,000 barrels of oil a day—from the broken well. The Coast Guard would need to carry out the disconnection—and evacuate workers—if forecasts predicted gale force winds in the area. (Gale force winds are 46 miles per hour or greater, which is slightly above the 39 miles per hour wind needed to declare a tropical storm.) A storm of that size would likely force a halt to any surface skimming on the surface of the ocean, or contained burns—two other means to control the growth of the spill, and the two ships drilling relief wells would need to stop and return to port. Between disconnecting the equipment, taking it to port and then reconnecting it over the spill site, Allen estimates that the well could be uncapped for two weeks in the case of a storm. That would mean hundreds of thousands of barrels of oil spilling into the Gulf that would have otherwise been captured. “Of course, we’re watching the story very closely,” Allen said. The scientific models show the storm taking a variety of tracks, some away from the well and toward Mexico, but others show it moving toward Louisiana. Nevertheless, meteorologists maintain that the Gulf of Mexico is experiencing warmer-than-normal temperatures making it ripe for hurricane formation. “I can not emphasize enough that this storm will pose a serious threat to the all important efforts required to contain the country’s worst oil spill disaster in history along with affecting operations across a large portion of the Gulf’s energy production region,” said Jim Rouiller, a senior energy meteorologist with Planalytics. Allen said the spill responders will act “out of an abundance of caution,” and could move “in advance of a declaration” from weather authorities about the storm’s strength. The reality is that we don’t really know what will happen if a hurricane hits an active oil spill like this one, because it’s never happened before. It could have some positive effects—the violence of the storm could disperse some of the fresh oil on the surface of the Gulf, aiding in its evaporation. The winds could drive the slick away from the shore; or, it could drive the oil onto the shore, which could be truly disastrous. If the storm pushes oil deep into the shore wetlands of Louisiana, the damage could be unfixable—not to mention the fact that a storm would be hitting the coast at a time when natural barriers still haven’t recovered fully from Katrina and Rita in 2005. The Gulf coast is like a boxer who’s been knocked down so many times they’ve become punchdrunk—another uppercut could do lasting damage. But given the fact that the spill and its tortured response seems to be following Murphy’s Law—everything that can go wrong will—don’t be surprised if the weather changes track. And if it doesn’t—there’s a lot of summer left.